TWO TOURS IN ONE. YOU CAN JOIN EITHER THE FIRST WEEK, THE SECOND WEEK OR DO BOTH! Includes superior hotels with private bath, ETCS Travel Documents, group airport transfers in Europe, entrances and services as noted, daily breakfast and dinner, and a private guide, host and translator with you at all times. Participants should enjoy walking, as some sights are available only to pedestrians. 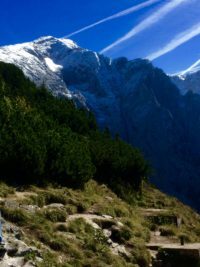 FEATURING German and French Wine Country, the Black Forest, the Swiss town of Basel, Salzburg and Innsbruck Austria, Berchtesgaden and the incomparable MUNICH! MAXIMUM NUMBER OF TRAVELERS IS ONLY 8-12. May 30: Overnight flight to Europe. May 31: We arrive in Germany and travel to the wine village of IHRINGEN. Nestled in waves of vineyards, Ihringen is picture perfect. Relax this afternoon, explore the village and enjoy a glass of one of the sparking vintages that make this area world famous. Overnight Ihringen. June 1: Today we travel into the Alsace Lorraine part of France to the town of COLMAR. Although in the middle of several conflicts over several hundreds of years, Colmar has been untouched by war. As a result it appears today much as it did in the 15th century with its charming half-timbered homes and cobbled lanes. The smell of oven fresh macaroons wafts over the town. We will walk the lanes, see the mighty cathedrals and enjoy the ambience. Overnight Ihringen. June 2: Into the university town of FREIBURG today to visit the brilliant red sandstone Gothic cathedral and the wonderful, lively morning market. This market, in operation since the 1300s, has handicrafts from all over the area, as well as succulent fresh produce and candies. Overnight Ihringen. June 3: A short distance away is the little town of BREISACH, directly on the Rhine River with its huge abbey towering over the town. After some time to explore we will return to Ihringen for an optional WINE TASTING this afternoon. Sample some of the delicious varieties of regional wine, like drinking liquid sunshine! Overnight Ihringen. June 4: South today, we again cross the mighty Rhine River and travel into SWITZERLAND. Our stop is BASEL. We will see the New Town below and then ascend the hill to the ancient Old Town which overlooks the river with great views. If you wish, visit the world famous Basel Modern Art Museum. Overnight Ihringen. June 5: Today we travel to the sparking LAKE TITISEE deep in the heart of the BLACK FOREST. This region is known for fantastical legends and fairy tales, as well as for Black Forest Cherry Torte. Enjoy! Overnight Ihringen. 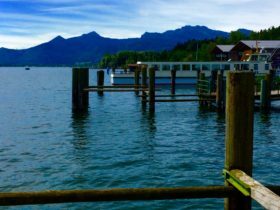 June 6: Through the green hills and across the broad plains of southern Germany today to the Alpine foothill town of TRAUNSTEIN. 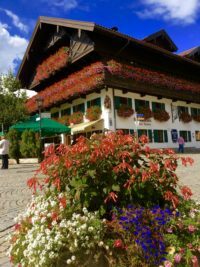 This afternoon we will explore the town, its airy central square, and see the Traunsteiner Brewery; visit later if you wish. The shops, boutiques and ice cream parlors on the main square are excellent. Overnight Traunstein. June 7. East today to the Alpine town of SALZBURG Austria. Best known as the birthplace of Mozart, it is of course well known because of THE SOUND OF MUSIC. 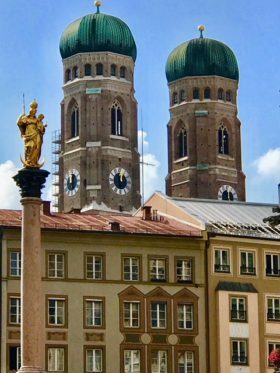 I will take you on a tour of the city from the Mirabell Gardens to Mozarts Birthplace to the famous torte restaurant Tomaseli’s. Overnight Traunstein. 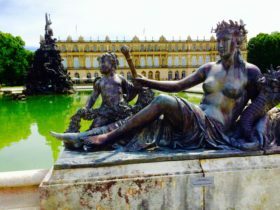 June 8: One of the most opulent castles in Europe is the HERRENCHIEMSEE PALACE, a short ride away. We will take a ferry out to the island and after a short forest stroll we will visit this, the second of King Ludwig’s palaces. It is one of the most magnificent you will ever visit. Overnight Traunstein. June 9: South through the heart of the Alps to INNSBRUCK Austria. Twice site of the Winter Olympics, it has some of the most stunning views in the world. We’ll explore the Medieval arcaded Old Town, walk along the rushing Inn River, and have free time to explore the Maria Theresa Boulevard. Overnight Traunstein. 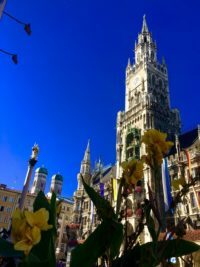 June 10: We spend the day in MUNICH! We will visit the Hofbrau Haus, see the Frauen Kirche, the New City Hall, Marian Platz and other icons. Take the time to climb St Peter’s Tower for great views. Wander through the elegant Oberpollinger Department Store. Munich is a world city with a small town feel. Wonderful! Overnight Traunstein. June 12: After an adventure-filled tour, we transfer to the airport for our return flight to the USA. PAYMENTS: $1500 p/p deposit with RESERVATION FORM. Balance due 98 days prior to departure; see TERMS & CONDITIONS. Make check payable to ETCS, Inc., 922 Oak Grover Road, Jackson MI 49203. Balance due 90 days prior to departure. See TERMS & CONDITIONS on the web site. Call Mike at 517-782-6847 or send an e-mail to Mike@mikerosstravel.com.